This book is really about “practice is underrated”, but I guess the editors need a more catching title for sales. The main point of the book is that effective practice is more important than other factors including specialty talent and general intelligence, and can overcome obstacles such as aging. The book even argues that creativity, commonly considered as a serendipitous process, is actually the result of significantly cumulative knowledge. And it is not just about any practice, and aimless hard-working and experience will not help. Effective practice must be deliberate and satisfies the following properties: (1) it must be designed to improve specific performance, (2) it must be highly repeatable, (3) there should be continuous feedback, (4) it must be mentally demanding, and (5) it is usually not fun. I actually disagree with the last one, and fortunately the book also pointed out for certain high achievers, practice can be fun. 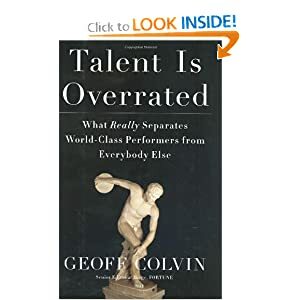 So the last part of the book is about the most important question: why some people are motivated to go through all these hard practice to achieve excellence while others cannot. The most convincing explanation is that some initial small differences get amplified through a positive feedback look of practice and performance: when a kid, who gains a little bit edge on certain activity (either due to innate advantage or benign environment), can be motivated to practice a little bit harder and longer, which translates to even better performance, which motivates more practice, and the loop goes on. I like this book as it fits my personal experience well. It has long puzzled me why some people have this innate drive to strive for the best while others do not, and this can happen among people with very similar genes and environments (e.g. siblings in the same family). The book also carries a positive message: anyone can achieve excellence if they are willing to go through the right kind of practice.